#9663 (Stats - Current test status for All Tests wont fit) – Trac Hacks - Plugins Macros etc. Now for the Problem: If i choose the Stats/Current test Status, with settings set to All Test Plans, somehow the stats sum up the untested test cases, but not the tested ones For explanation: I have 1 Test Catalog with 2 Test Plans running(both including all TCs from the catalog). The Catalog includes ~200 Test Cases. Now the Statistic for all TPs recognizes both TPs use the same TCs, so it says ~200 untested TCs which is absolutely ok for me. But as the test proceeds, i recognized that failed and succeeded tests aren't sumed up, so after both TPs finished, i have like 350 sucessful tested TCs, 50 failed and -200 untested. v5vrn.png​ (5.7 KB) - added by Roberto Longobardi 7 years ago. Maybe Roberto could add an info about that in the WiKi. So atm untested TCs ARE summed up, but tested/failed aren't. This means, you can fail/suceed more than 100% of the untested TCs. Andreas, unfortunately "anonymous" (:D) is right. Actually there is a bug in the code with how untested TCs are counted. The number of untested TCs is calculated subtracting from the total number of test cases the number of successful and failed ones. The count is right if we want the stats for only one test plan (selecing from the listbox), or if we ask for "All Test Plans" but there's only one test plan. But in case more test plans that share some TCs, the total number of TCs remains constant, while the number of successful and failed ones increases as the user changes the status of any TC. This problem is not easy to fix. One may think about counting the number of untested TCs, but this is not easy, because when you create a test plan that contains all the TCs in a catalog, no record is actually created in the database (besides the record for the test plan itself), so there ios nothing to count. This is not true when a test plan has only a selected set of TCs in the catalog. This actually creates one record with status "untested" for each selected TC. In fact I'm sure in this case the count is correct. Mumble mumble.... Do you have any suggestions? 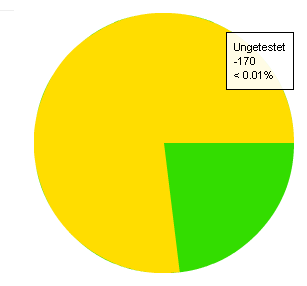 In the upcoming 1.7.1 release, I've disabled the "current test status" pie chart for "All test plans". It will display the following message: "'Current test status' is not available for 'All test plans'. Select a test plan to display this chart". leave as closed The owner will remain Roberto Longobardi.